The five biggest Chinese banks posted weak profit growth in the first quarter of the year--the result of economic slowdown, surging bad loans, market-oriented reform on interest rates and increasing challenges from online investment products. The five listed state-owned commercial banks--namely the Industrial and Commercial Bank of China, China Construction Bank, Agricultural Bank of China, Bank of China and Bank of Communications--colloquially known as the Big Five, all reported a net profit growth of less than 2 percent in the first quarter of the year, down from an average of about 10 percent from the same period last year, according to figures from their quarterly financial reports to bourses. A report from PricewaterhouseCoopers said that the net profits of some of Chinese banks will slide into single-digit growth or even negative growth in 2015. As a matter of fact, the profitability of China's commercial banks has been declining over the past years. According to data from the China Banking Regulatory Commission, the industry watchdog, net profits of commercial banks totaled 1.55 trillion yuan ($250 billion) in 2014, an increase of 9.65 percent from 2013, much lower than the profit growth ranging from 14 to 36 percent recorded between 2008 and 2013. Yu Fenghui, a financial commentator, said the sharp slowdown in profit growth is first and foremost caused by a lackluster broader economy and the resulting operation difficulties in businesses. China's economic slowdown and rebalancing efforts are taking a toll on the country's financial system. The world's second largest economy grew 7 percent year on year in the first quarter, the lowest quarterly growth rate since 2009. "It's highly unlikely for banks to rake in the profits they used to amid an economic slowdown, not to mention operation difficulties amongst businesses," Yu said. Yu forecasted this is just a start. "In the second and third quarter, the Big Five may even post negative profit growth," Yu warned. Another reason for banks' narrowing profits is the imminent market-oriented reform on interest rates. China retains a government-mandated cap on how much the nation's traditional banks are allowed to pay on savings deposits. A gap between that ceiling and lending interest rate is a major source of Chinese banks' profits. However, the ongoing interest rate marketization will affect the profitability of the traditionally highly regulated banking sector. Net interest margins in banks are expected to shrink as China moves to phase out the cap on bank deposit rates. "The final liberalization of deposit rates is the last step of interest rate marketization. It's quite likely to be realized in China this year," said central bank governor Zhou Xiaochuan during the annual legislative session in March. Zhou Chunsheng, a finance professor with the Cheung Kong Graduate School of Business, said after the removal of the cap of deposit rates, the deposit rates will increase because banks want to attract depositors and the gap between deposit and lending rates will be reduced, further hurting banks' profitability. Adding to the pain are the rising bad loans in the Big Five. In the first quarter of the year, non-performing loan (NPL) ratio increased at all the Big Five state-owned commercial banks, signaling mounting pressure from soured credit. 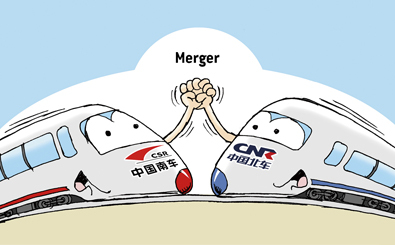 The newly added NPLs of the Big Five totaled 70 billion yuan ($11 billion) in the first quarter, more than twice the amount in the first quarter of 2014, according to their financial reports. Yu said the real condition may be even worse than the figure on the paper. 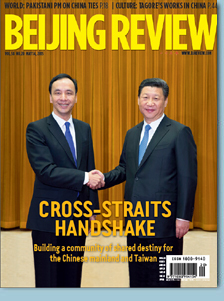 "They are paying a hard price for the irrational macroeconomic policies after the financial crisis," Yu said. "To cushion the impact of the financial crisis, the government launched a credit-fueled stimulus package in 2009, which has resulted in severe overcapacity and rising bad loans in the Big Five." Aside from the internal problems, big banks also have to deal with outside competitors. With a boom in online financial services, financing channels have greatly diversified in China. More and more people are investing their savings in online financial platforms, and more and more of them are gaining funding without going through a bank, dealing a heavy blow to traditional banks. 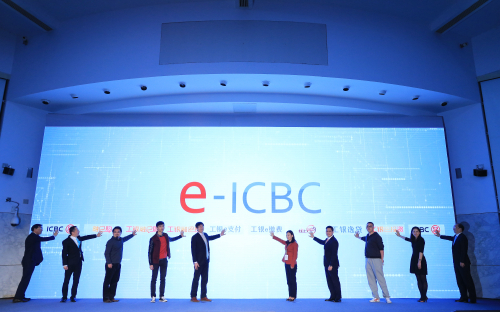 Ever since Yu'ebao (literally meaning leftover treasure), an online investment product provided by China's e-commerce king Alibaba Group, was launched in June 2013, imitators and competitors have taken off in China, posing a potential threat to traditional banks as more and more spare cash has been transferred to those online financial platforms from brick-and-mortar banks. With its attractive yield, better flexibility and fewer restrictions, Yu'ebao was an instant hit. Many Chinese Internet companies followed suit and developed similar financial services, including instant messenger developer Tencent, search engine giant Baidu and the e-commerce arm of electronics retailer Suning. According to Asset Management Association of China, the market value of money market fund, in which those online wealth management products are mainly invested, skyrocketed from the meager 300 billion yuan ($48 billion) at the end of 2011 to 2 trillion yuan ($323 billion) at the end of 2014. As money flocks to those online wealth management products, bank deposits have significantly fallen. Among the Big Five, Bank of Communications had the quickest deposit growth at 6.59 percent and Industrial and Commercial Bank of China has the weakest growth at only 1.87 percent in the first quarter compared to the end of 2014, according to their financial reports. Newly added yuan deposits stood at 4.15 trillion yuan ($669 billion) in the first quarter, 1.64 trillion yuan ($265 billion) less than the same period last year, according to the People's Bank of China, the central bank. Financial commentator Yu said the boom of online financial products has hit traditional banks really hard. "It's eating into their three pillar businesses--deposit, loan and intermediary services--faster than people expected," Yu said. "Fewer people choose to deposit their savings in banks and fewer turn to banks when they have financing demand, while payment clearing services, which used to be offered by only banks, have been to a large extent replaced by online third-party payment platforms, such as Alibaba's Alipay and Tencent's WeChat Wallet." In the past, traditional banks shrugged off online financial products. Now, they are trying to catch up, Yu said. The Big Five are on the go to guard their territory. To fight for deposits, previously assured banks have been humbled by proactively developing their online business products, such as e-bank and banking service apps on mobile phones, and releasing similar online wealth management products to Yu'ebao. According to data from Youchoose Wealth, an asset management company based in Beijing, the market value of banks' online wealth management products more than doubled to 457.9 billion yuan ($73.9 billion) at the end of 2014, from the less than 200 billion yuan ($32 billion) at the beginning of 2014. Hong Hao, President of the Association of China Internet Financial Industry, said in order to cope with challenges from Internet companies, traditional banks should change their mindset. "Traditional banks have to innovate, to improve their services and to diversify their product and service portfolios. Banks should be a marketplace for all types of financial products and services and should change from product-focused services to those that are customer-centered," Hong said. "The Internet is only a tool. Finance is the core. Banks should use the big data in hand to create a financial platform and mobilize all the resources to cushion the impact of Internet finance." Zhou, the finance professor with the Cheung Kong Graduate School of Business, said traditional banks have advantages and disadvantages when they try to roll out their Internet financial products or services. "The advantage is obvious. They have brand, influence, channels and customer bases that emerging Internet companies will find hard to rival," Zhou said, "but they also have disadvantages in innovation. For instance, competition between the bank's online financial products and traditional financial services should be avoided. This will to a large extent confine their ability to innovate."